NOTICE: Please call the venue for hours of operation in January. 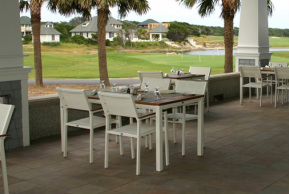 Dining Options on Bald Head Island are limited, but provide a unique variety of experiences. On Bald Head Island cooking and grilling are coveted past-times in and of themselves. . . an upscale market provides the resources. 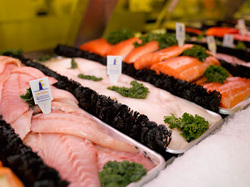 Fri.& Sat., 8 a.m.-9 p.m.
Bald Head Island's Maritime Market offers the freshest seafood, steaks, produce and fine wine selections for even the most discerning chefs. If you don't feel like cooking you will find a variety of prepared foods, including freshly-prepared deli items like roasted chicken, pre-made salads and deserts. For a true shopping experience to delight the senses, The Maritime Market is the place. Enjoy a gourmet coffee as you browse. You are also welcome to bring your own groceries from the mainland. Cocktails & appetizers, 3:30-4:30 p.m. 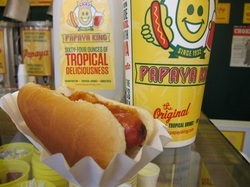 Dining on Bald Head Island changed in October 2011 when MoJo's came to life. 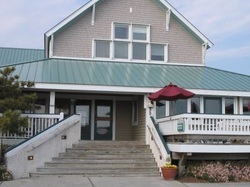 Fomerly Ebb & Flo's, this is easily the most popular dining venue on Bald Head Island. 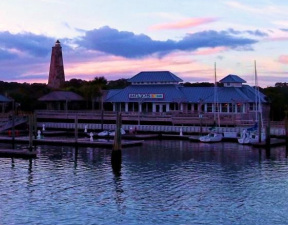 The relaxed setting overlooking the Marina embodies the Bald Head Island experience. MoJo's delivers imaginative food, welcoming hospitality and a relaxed family friendly environment. Providing outstanding wines by the glass or bottle and new specialty cocktails, coupled with one of the best views on Bald Head Island, MoJo's on the Harbor changes the dining experience on Bald Head Island for visitors and residents alike. Affectionately known as the “Peli”, this poolside, family friendly venue has it all! 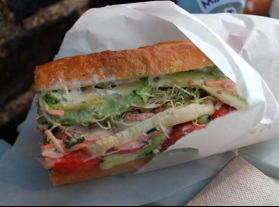 The Peli’s menu features items such as breakfast pizzas and pastries, bagels, and coffee, as well as fantastic deli sandwiches, pizzas made to order, ice cream, and great burgers. Peli seating is available on the pool deck, on our “Peli Perch” which is our elevated balcony that overlooks the Atlantic, or inside where you can enjoy the hottest sporting events on the large screen television. Last, but not least, the Peli’s poolside bar gives the relaxing vacationer the opportunity to sip a cold beverage while watching the kids enjoy a dip in the pool. 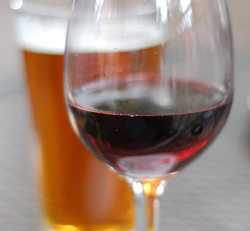 This outdoor wine and beer bar overlooks the Harbour, offering a great selection of domestic, craft and foreign beers as well as an affordable selection of wines by the glass. 'Bits" include popcorn, peanuts, fresh bread and cheeses. Great sunsets, cool afternoon breezes and a friendly island atmosphere. 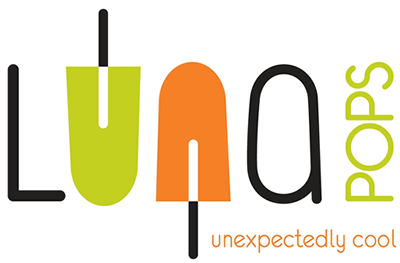 Relax on the Sail Shop porch, overlooking the Marina and enou an all natural fruit Luna Pop ice cream or fresh coffee and pastries. Great selection of outdoor wear, t-shirts, hats and sunglasses for your next adventure. For an affordable lunch or snack, try the fresh, never frozen, all beef Sabrett Hot Dogs and Suasage, combo specials, chips and cold drinks. Look for the colorful 'Dune Dog' Cart next to the Sail Shop in the Harbour area. 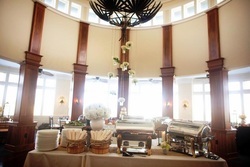 The Grille is the Club’s primary dining venue and is where lunch and dinner are served daily in the clubhouse. Sit by the window in the Grille and you’ll see golfers working on their game at the newly renovated practice facility. It isn’t unheard of to see one of our resident gators crossing the range moving from one lagoon to another, oblivious to who’s watching! The Grille features outside dining and a full bar. The menu features steak and seafood favorites as well as appetizers the whole family can share and desserts you won’t be able to go home without! The Palms features panoramic views of the croquet greenswards and hole #10 & #18 that make this semicircular venue stand apart from the rest. The relaxed social setting is highlighted with large screen televisions, a fully stocked bar, and an informal place to enjoy a cold beverage after a round of golf. The Palms menu features pub-type favorites that include appetizers, salads, sandwiches, and much more. Availability of the Palms to our members may vary due to special events. Formerly a restaurant in the harbour area, The River Pilot Cafe is now an event and catering facility. 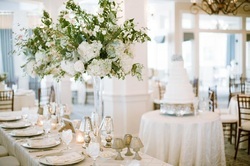 As Bald Head Island’s reputation as an ideal locale for weddings and corporate meetings has grown, the need for special event space grew with it. With its exceptional views of the Cape Fear River, ample parking and climate-controlled setting, the River Pilot Café adds a comfortable, well-appointed space to the island’s event locations. While catering menus can be tailored to satisfy individual tastes and requirements, the River Pilot’s Southern Regional dining concept, which has enjoyed many accolades from island property owners and guests in recent years, will remain a signature element of available menu options.